This is simple, and only require that the crumbly cheese be sprinkled on top of your burger after it has been grilled. The texture of this cheese means that it will melt beautifully onto your burger. The rich flavors are a perfect complement to any kind of red meat, from low cost ground beef to more expensive bison and Angus burgers. That's how Roz of la bella vita did her blue cheese burger with bacon, basil and gorgonzola. Do give time for the crumbled cheese to melt and the flavour to mellow and permeate the patties before topping with the bun. Make a blue cheese sauce or spread. This is good for people who think the cheese is a bit too strong. Dilute the sharpness of this cheese with a little milk or cream or add some fresh herbs to tone it down. How about mixing some blue cheese crumbles with mayonnaise, cayenne pepper for a topping to this anaheim burger. Or whip up some blue cheese dipping sauce. If you are feeling a bit more adventurous, add the cheese to the center of the uncooked patty. As the meat cooks, the cheese melts and begins to incorporate itself throughout the patty. Here is a recipe for blue cheese stuffed chicken burgers. You didn't think that blue cheese only goes with beef right? You can also try stuffing ground turkey burgers. Check out the detailed instructions and photos on how to stuff the blue cheese by chefinjeans. It doesn't have to be a burger. It can be a blue cheeseburger cup: a beef and onion mixture baked in a wonton cup mixed and topped with excellent blue cheese. Or a bacon and beef slider kebabs. I much prefer a smaller portion as I am fairly petite in size. Blue cheese is a type of cheese that has the penicillium mold introduced to it. It looks like moldy cheese as there are blue or greyish-green veins or spots all over the yellow cheese. It has a strong sharp smell with a equally strong sharp taste. Some may smell a little like stinky feet. It really need some getting used to. The appearance of blue cheese can be pretty scary. I mean dark-green spots or veins are usually associated with harmful molds. It seems counter-intuitive to eat mold. You certainly cannot eat it by the mouthful, it will gag. It originated in Europe and is considered a premium cheese. Famous brands include Roquefort (French), Gorgonzola (Italian) and Blue Stilton (UK). 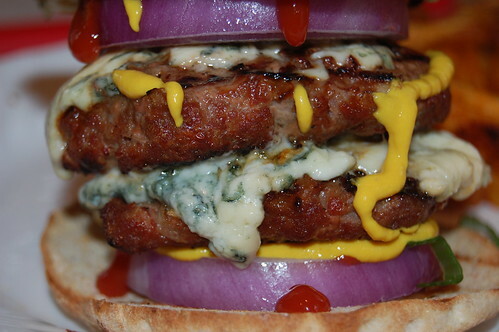 Whichever way you make your blue cheese burger, I hope you try it with some of the recipes mentioned here.